Dulcolax = FREE + Moneymaker w/ Coupon! 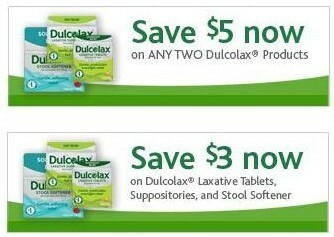 Not only can you get Dulcolax laxative for FREE at Walmart, but you'll actually make money on it! = FREE + $1.02-$1.04 overage! Just check one or both coupons, register, and print out! You can print 2 of each coupon per computer. NOTE: I haven't printed out the $5/2 coupon yet, so I'm not sure if there's any restrictions on it. However, I did this deal last month using that coupon and was able to score $1.04 overage with it. So unless the coupon has changed, everything should be good!